But for the astronomically minded, sometimes we think about getting closer to the Sun in other ways. The Sun is the closest star to Earth, even though sometimes it feels completely absent. But what are the other stars close to Earth and why can’t they help keep our toes from freezing? I can’t really help you with the second question, but for the first question, we can explore all the close stars to Earth. Proxima Centauri won’t be the closest star to the Sun forever, though. In about 25,000 AD, Alpha will edge out Proxima. 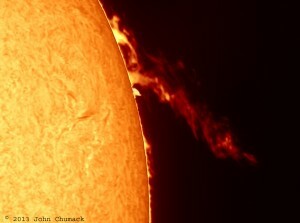 Alpha will hold the title about 10,000 years before it’s briefly stolen away by two other stars. Ross 248 is currently 10.3 light-years away and shining at a dim magnitude 12.29 in the constellation Andromeda. But the star is a speedy one and headed in our direction. 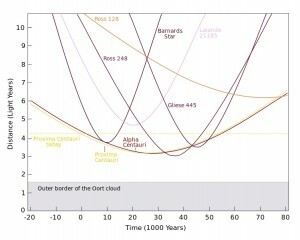 By about 35,000 AD, Ross 248 will be closest to the Sun. It will pass its closest point to Earth and the Sun, within 3.1 light-years, around 38,000 AD. Ross 248 will continue its motion and eventually recede from us until it’s no longer the closest star, in 44,000 AD, at which point another star that has been swinging inward will be the closest, Gliese 445. Currently 17.6 light-years away in the direction of the constellation Camelopardalis, Gliese 445 shines at magnitude 10.8. Gliese will come within 3.45 light-years of the sun, although it will never be bright enough to be seen with the unaided eye (unless our eyes have evolved so much by 44,000 AD that we can see extraordinarily dim objects). Once Gliese 445 sails back out from the Sun, the title of closest star will go back to Alpha Centauri. This thought experiment makes it clear that the Sun is our best source for light and heat now and in the foreseeable future. And that a beach vacation in the dead of winter is a much more viable option than hoping for heat from nearby stars.